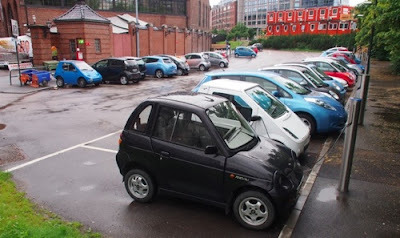 Many blogs have recently posted about booming EV sales in Norway, where electric and hybrid vehicles made up 5.2% of new vehicle sales for 2012. From a population of only 5 million, over 10,000 EVs have been sold in Norway. Despite having only 1/60th the population, Nissan Leaf sales in Norway last year equaled 1/2 the number sold in the US while the Mitsubishi iMiev, also re-badged and sold under the Citroen and Peugeot brands, has been the biggest selling car in its segment for the past 2 years. While most reports focus on the popularity of EVs in Norway being primarily due to government incentive such as EVs being permitted to use bus lanes, avoiding city congestion charges and free parking in municipal car parks, it is the tax structure that provide the most compelling reasons. Electric cars in Norway aren't subject to import taxes but the purchase price for EVs in Norway is no cheaper than most markets outside the US (for example: Opel Ampera costs US$66,400). What does make a difference is high import taxes imposed on all ICE powered cars which results in the purchase price differential between ICE and EV being much smaller than in most other EV markets. Due to high fuel taxes, Norway boasts the world's most expensive petrol costing the equivalent of US$2.50 per litre ($10 a gallon). Alternatively, Norway's electricity is 99% hydro powered, costs US$0.06 kWh and is available from a national network of 3,500 charging posts and 100 fast-charging stations. As a result the energy cost of EVs is better than 1/22th that of an equivalent ICE powered car, the total costs savings of EV ownership become irresistible.